The name of the Club shall be the Mashpee Women’s Club. The mission of this Club is to bring all women of Mashpee and surrounding towns into a social environment, providing educational and recreational programs to the benefit of our members and charitable programs to support our towns. The Club’s first meeting was December 9, 1997. Section 1. Any interested woman is eligible for membership. Application for membership may be made to the Membership Chairman. Application for membership shall be acted upon in the order in which requests are received by the Membership Chairman. Section 2. The membership year shall be from September 1 to August 31 of the following year. To be included in the annual directory, dues must be paid by October 1. Section 1. Club dues per membership year will be set on consideration and approval of the Executive Board. Section 2. The fiscal year of the Club shall be from September 1 - August 31 of the following year. Section 1. The officers of this Club shall consist of a President, Vice-President, Recording Secretary, Corresponding Secretary, and Treasurer. Section 2. A Nominating Committee, appointed by the President, shall consist of a Chairman and two (2) current members. This Committee shall be appointed not later than three (3) months prior to the Annual Meeting. This Committee shall present to the membership a proposed slate of officers to be approved by the Membership at the Annual Meeting. This slate of officers should be presented to the Board one month prior to the annual meeting. The Board will then conduct a vote on a slate of officers to present to the membership at the Annual Meeting. Prior to voting at the annual meeting, nominations from the floor shall be accepted at the annual meeting. A 2/3 majority vote is needed by the membership attending the annual meeting to approve the new slate of officers. Section 3. The terms of all Officers shall be for a period of two (2) years commencing on September 1. No officer shall hold the same office for more than two (2) consecutive terms. Section 4. Should a vacancy be created by the resignation of an Officer, the Board shall be empowered to fill said vacancy by appointment. The President shall appoint the Board of Directors that shall include, but not be limited to, a Charities Chairman, an Historian, a Membership Chairman, a Program Chairman, and a Public Relations Chairman and a Newsletter Editor. The immediate past President shall serve on the Board as an advisor and voting member for a 2-year period. Co-chairs of Committees may attend all Board meetings, but the Committee is limited to 1 vote. Section 1. The Executive Board meetings shall be held the 2nd Tuesday of each month. A regular meeting of the general membership shall be held the 3rd Tuesday of each month. Section 2. The Annual Meeting shall be held as part of the June general membership meeting. A special meeting of the general membership may be called at any time by the President and must be called by her upon the written request of twelve current members of the Club. These by-laws may be amended at any Annual Business meeting by a 2/3 vote of the current members present at that meeting, providing notice of the proposed change has been given at the previous meeting and by regular or electronic mail. ● Preside over monthly luncheon meetings, conducting them according to the pre-established format. ● Attend and preside at monthly Board meetings and provide an agenda in advance of the meeting. ● Oversee election of Officers; appoint a Board of Directors and Committee Chairs. ● Direct the development of goals, policies, and procedures to guide the Club. ● Appoint annually, by March, an independent 3 person Nominating Committee (Chairperson and 2 current members) to prepare for the June business meeting and election. The president will conduct the election portion of that meeting. ● Annually negotiate luncheon costs and menu. ● Review and approve the Club website and its content with advice of Board. ● Provide a “President’s Message” for each quarterly Club newsletter. ● Generally serve as the public image of the MWC, (e.g., attend various functions and report to the Board) or appoint a Board member to attend when the Club should be represented. ● Send a courtesy call or email to any new members. Names will be provided by membership committee. ● Attend monthly Board meetings and luncheons. ● Perform the duties of the President in her absence and be willing to succeed to the presidency. ● Provide administrative support on Club management (e.g., assist in the development of surveys, drafting policies and procedures, publication of quarterly Club newsletters, and maintain data on member interests). ● Provide support with all tasks assigned to the President. Be willing to take on any task delegated to her by the President. ● Attend monthly Board meeting and luncheons. 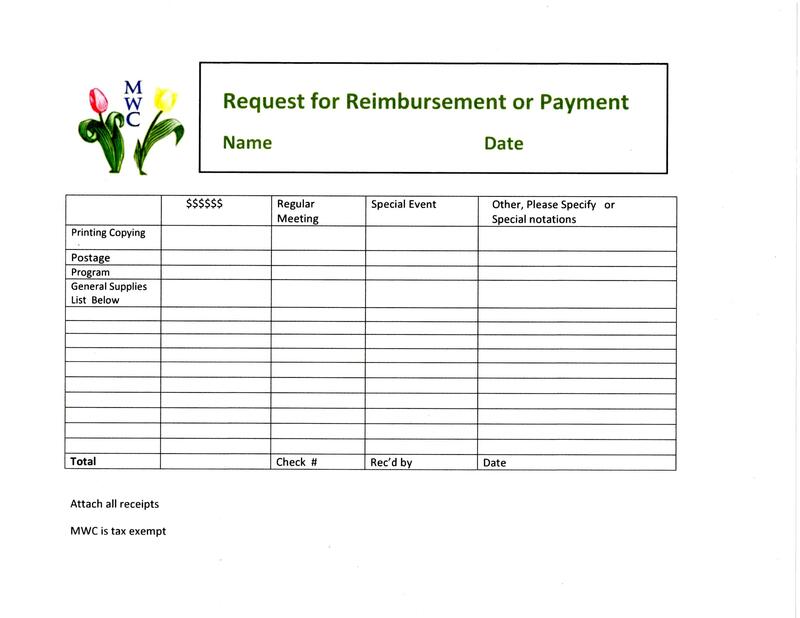 MWC logo paper or cards (including sympathy and get well notes, thank you letters for luncheon programs, and 50/50 donation letters with check to charities). ● Keep the official minutes of all monthly Board meetings. ● Send draft copies of monthly minutes to Board members for their review/comment before the next meeting to facilitate acceptance. ● Prepare minutes of the annual June Business Meeting and read the previous year’s minutes at that Business Meeting. ● Receive all monies paid to the Club and deposit them in established accounts in a timely fashion. ● Maintain up-to-date records for checking, charities, and investment accounts. ● Balance accounts and provide written monthly and annual reports to the Board. ● Arrange a schedule for periodic review of the Club’s financial records. ● Prepare and file taxes and other financial or regulatory forms as required, including raffle permits. ● Hold a key to post office box. ● Develop an annual budget for the Club, working directly with the President and Vice President. ● Maintain significant financial and regulatory records to pass on to next Treasurer and assist in the selection of a trainable assistant. ● Recommend charities to benefit from club fundraising with advice from Members and approval by Board. ● Form a committee and sell 50/50 raffle tickets at monthly luncheons. Charitable organizations must be pre-approved by the Board and generally may not receive funds more often than every six months. ● Maintain current records of donations to specific charities. ● Form a committee to recommend annual scholarship recipients to the Board coordinate participation in Mashpee High School’s Award Day and presentation at a Club luncheon for recipient and parents. ● Provide an update of charitable activity for each quarterly Club newsletter. ● Review list of 50/50 charities at least once each year to verify existence and relevance of the charity. ● Alert Board to upcoming anniversaries or other significant Club events. ● Create and maintain a scrapbook of articles and pictures for each year about Club news and events from newspapers and other sources. Keep completed annual scrapbooks at the Mashpee Public Library. ● Provide occasional displays of interest or past events at monthly luncheons and/or as an article in quarterly newsletter. ● Form a committee to plan and implement a variety of programs for monthly luncheons, obtaining advance approval from the Board for a budget to cover the programs and their cost. ● Provide list of upcoming programs for inclusion in quarterly MWC Newsletter and MWC webpage. ● Notify Membership Chair, BC Group, and Treasurer the number and name(s) of speaker(s)/entertainer(s) and which, if any, will be guests for luncheon in time to include them in the total luncheon count. ● Greets speakers(s)/entertainer(s) and seat them at President’s table if they will join us for lunch. ● Coordinate with the luncheon venue in advance for any special equipment (e.g., extra table, overhead projector, screen, etc.) if needed by speaker/ entertainer and obtain set up assistance if required. ● Introduce speaker(s)/entertainer(s) with brief biography at luncheon and provide copy to Public Relations/Publicity Chair. ● Keep records of programs and their contact person, address, cost, etc. and provide to next Program Chair. ● Keep expenses within budgeted guidelines. ● Form a committee to take notes, write articles and provide photographs for publication in the Mashpee Enterprise by their deadline. ● Assign a committee member to take photographs at other club events to accompany the newspaper article and/or for the Historian’s scrapbook. ● Seek other opportunities to publicize Club programs, events, and charitable activities and maintain copies of press releases, newspaper articles or other information that would be useful to pass on to next Public Relations/Publicity Chair. ● Provide advice to President and Board for 2 years subsequent to term served as an ex officio voting member of the Board. ● Remind Board and all members of deadlines for newsletter articles or photos. ● Prepare and distribute quarterly Club newsletter for membership. ● Coordinate with Treasurer and provide summary of current financial position. ● Mail quarterly newsletters to those who do not have email. ● Attend monthly Board meetings when requested by Board. ● Work with President and Board to develop the plan and budget for a fundraiser. (Note: follows established financial procedures for approvals and expenses). ● Maintain records for each fundraiser. ● A minimum of one fundraiser must be planned per year, in accordance with our mission. ● Maintain database of members, tracking their interests in various activities and committees. ● Provide potential new members with membership applications and information about club activities and committees. Follow up by phone or email. ● Assist Web Mistress in publishing and distributing the annual MWC directory. ● Hold post office box key and retrieve mail for the Club, distributing to the appropriate Board members promptly. Collect membership dues and luncheon checks. Keep a record of each member’s payment, also any payment from a guest. ● Deliver all checks to the Club Treasurer promptly for deposit. ● Create a list of members and guests attending the monthly luncheon for the President and the greeters, noting new members on this list. ● Notify the luncheon venue of the reservation numbers for the monthly luncheons and the number of tables needed. ● Produce mailing labels and send monthly luncheon post cards. Assist with annual Directory mailings and other correspondence to members who only use regular mail. ● Form a committee of luncheon greeters each month. Assign three or more greeters as needed for each luncheon to check in luncheon attendees. Also, they may assist with welcoming and introducing any new members to the President and other members. ● Plan and implement “New Member Coffees”. These are informal social gatherings for new members, to introduce them to some of the Board members of the club and make them feel welcome. These events are usually held in someone’s home. Expenses incurred with hosting can be reimbursed by the club. This is an opportunity for new members to learn about the Club. ● Maintain MWC’s web page and regularly post updates of a variety of information. Design monthly luncheon information for website and monthly post cards. ● Each year, design new MWC Directory, bring to printer. When completed, deliver to the Membership Committee for distribution. 1. Donations in honor of a deceased Board member shall be limited to $100 sent to the charity of the family’s choice. 2. Club donations will be made to qualified non-profit organizations that benefit primarily Mashpee and surrounding towns on Cape Cod. 4. MWC selects scholarship recipients from the top 10% of the Mashpee High School senior class. 5. The Charity committee will sell 50/50 raffle tickets at monthly luncheons. Recipient organizations must be pre-approved by the Board and generally may not receive funds more often than once every six months. 6. Members are encouraged to bring guests to monthly luncheons; however, other activities may be limited to members only. 7. Committees may be chaired by more than one person. All co-chairs are invited to attend monthly Board meetings if they so desire. Each committee is allocated one vote on the Board. 8. Exceptions to Club policies may be made by a majority vote of the Executive Board if in conformance with State and Federal requirements. 9. It is the expectation that those serving on the Board of Directors and the Executive Committee will support the Club with their attendance at the monthly luncheon meetings and special Club activities.